Cibola creates human-centered systems and experiences that help your business do well and do good. 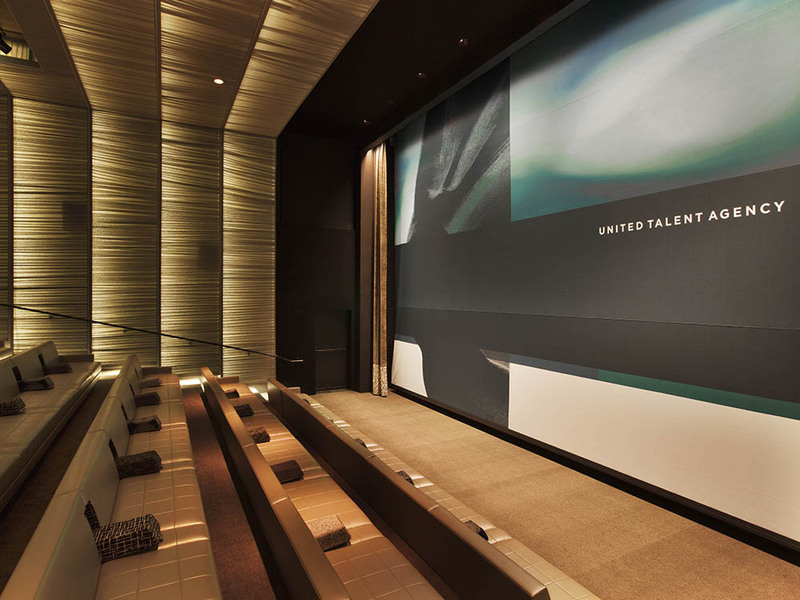 United Talent Agency’s headquarters buildings are a fitting showpiece for one of the entertainment industry’s most prestigious firms. 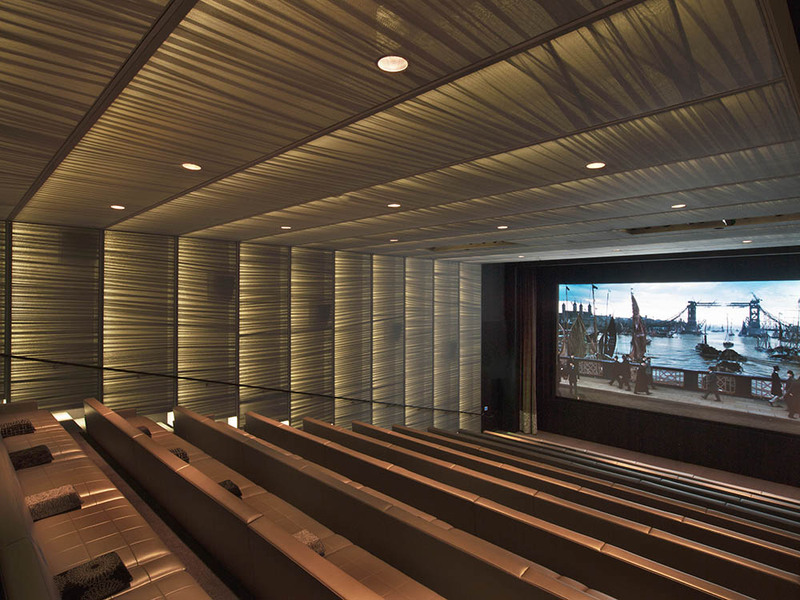 The Agency’s relocation provided a fresh opportunity to design a number of large venues, including a 165-seat Screening Room. 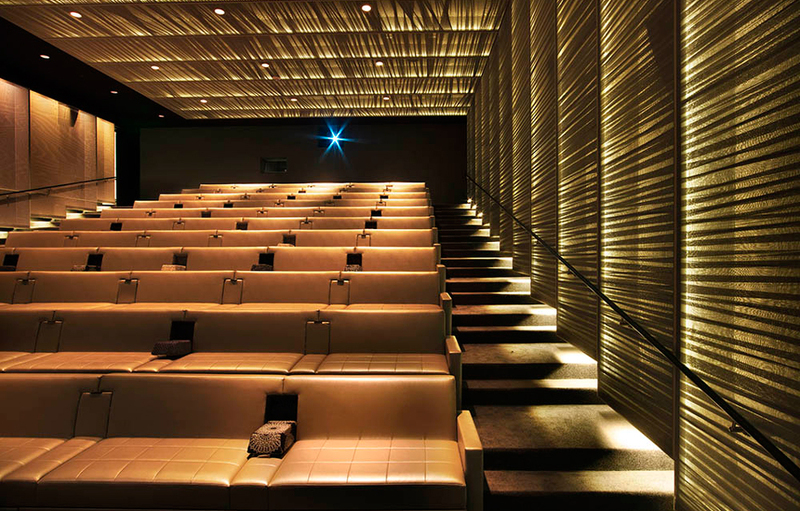 UTA’s desire for an innovative Screening Room led to an elegant space that makes no compromises in quality. From an aesthetic perspective, the traditional symmetrical black box has been replaced by a warm and welcoming environment with an asymmetrical design. 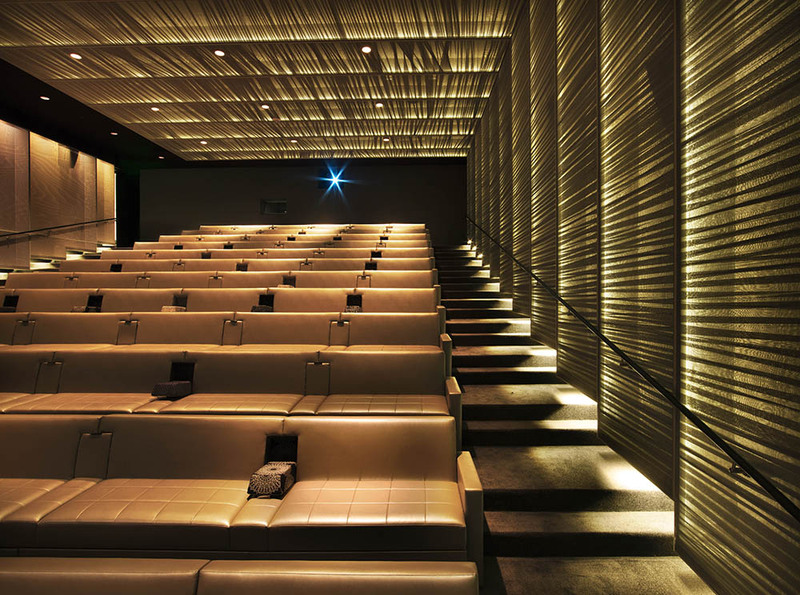 Unlike the flat, dim light found in most theaters, UTA’s Screening Room features glowing walls and exterior windows with shades for light and sound control. In lieu of theater seats, custom banquettes with bolsters support flexible seating arrangements. 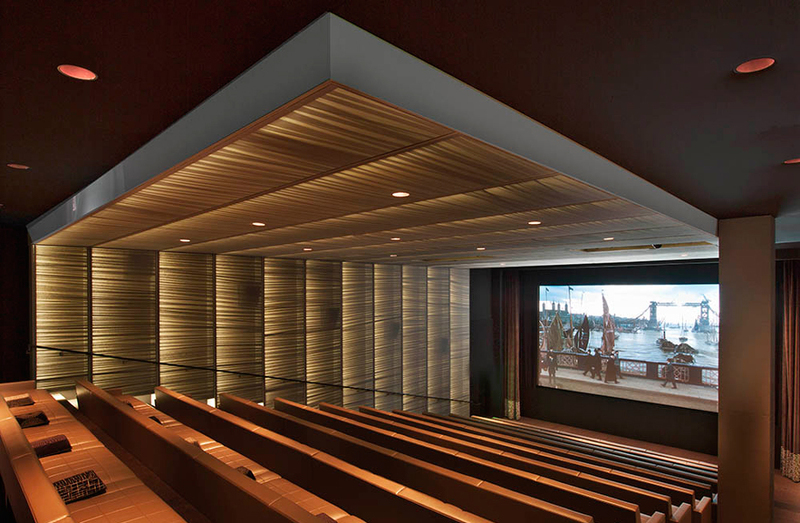 The architect’s introduction of warm finishes, unconventional seating and exterior windows are broad strokes that make UTA’s Screening Room equally comfortable for an intimate film screening or a large book reading. 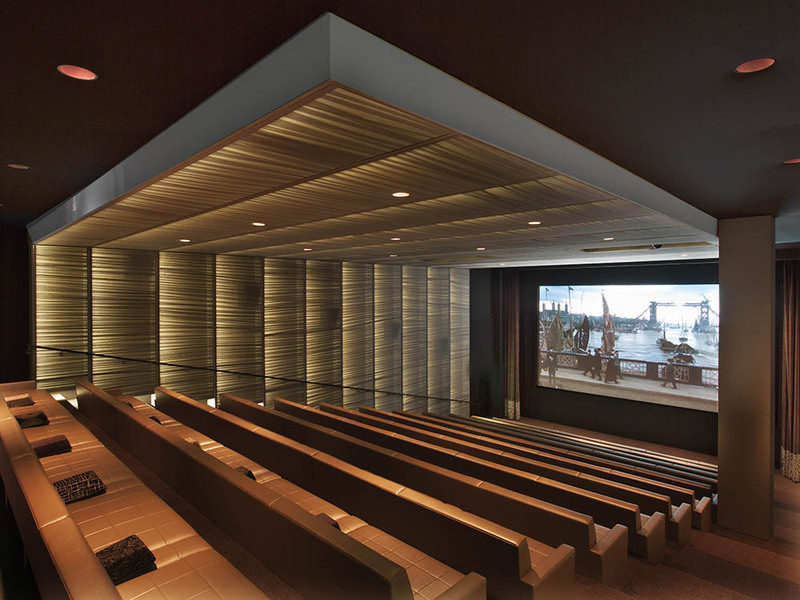 Although equipment selection is essential to creating a high-caliber screening room, the technical design of the room itself is equally important. The design team used 3D modeling extensively to study sightlines, to engineer the audio system and to render the lighting and finishes for client approval. Side wall and ceiling loudspeakers are located behind translucent, sound-transparent fabric wrapped around illuminated shadow boxes that were tested with full scale mockups before construction. From a technical perspective, UTA’s Screening Room accommodates finished content, work in progress and interactive media. The fully digital audio and video systems easily support a broad range of media including DCP, Blu-ray, ProRes, DirecTV and gaming consoles. In support of UTA’s many Indie Film clients, a concealed input panel at the Screening Room’s “sweet spot” allows filmmakers to directly connect a high definition camcorder to the digital projector and audio system. Microphones and a confidence monitor are used for panel discussions and presentations featuring UTA clients. For technology clients, the room is also generously equipped with wireless access points to support audience interaction through up to 165 tablets or other mobile devices. With a commitment to delivering the highest quality sound and picture in their Screening Room, UTA’s first decision was whether or not to include motion picture film projection. After their research showed film screenings were no longer an industry or client expectation the Agency decided to install a purely digital system that incorporates a large venue 4K projector and active 3D display. 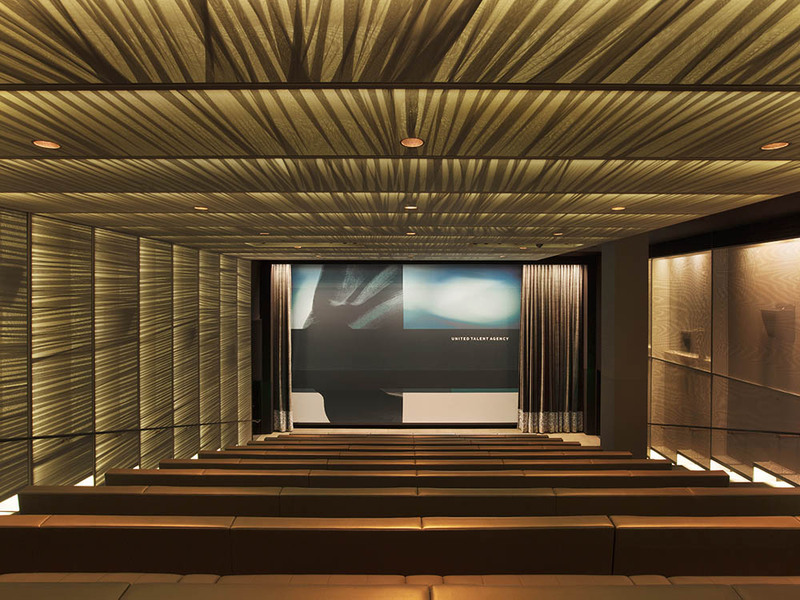 With 17 loudspeakers and 6 additional subwoofers, the Screening Room’s audio quality is truly world class. The Projection Room houses the nucleus of the system: a cinema server, digital audio processor, and matrix media switching/control platform. The control system provides automated switching of HD signals, including those that are HDCP encrypted, and also automates the Screening Room’s operations through iPad control panels. 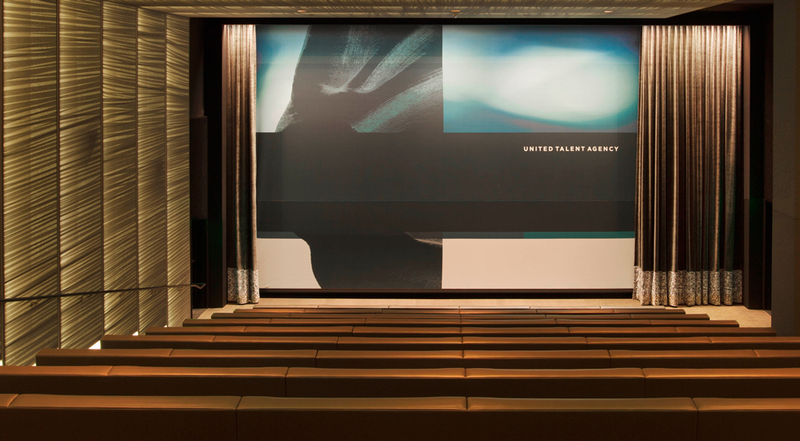 To support UTA’s desire for flexible use, the Screening Room is electronically connected to a number of other spaces in the Agency’s headquarters, including a two-level pre-function area, a 300-seat meeting room and an outdoor courtyard. The digital video and audio platform also allows non-encrypted signals to be shared with remote locations. This approach opens the door for UTA to create multi-venue events, providing new kinds of interaction within and outside the Agency. By challenging their design team to think outside of the box, UTA gained a best-in-class Screening Room that will serve the Agency well into the future. Key Element: 4K, 3D projection and a 23-speaker audio system. ©2019 Cibola Systems. All Rights Reserved.